Welcome to the world of reefer madness! Yes, like any good drug this stuff is addictive! But unlike good drugs, the hobby need not be terribly expensive or dangerous (besides, reefs can be appreciated both by you and your friends in law enforcement). 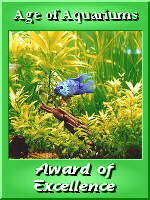 This site is devoted to my 10 gallon micro reef and both are always undergoing changes and additions. You may ask: why only 10 gallons? Well it's not because I desire to stuff as many fish, anemones, corals and other invertebrates into the smallest place possible. I assure you I'd be quite happy maintaining a 100 gallon reef tank, but it's just not possible financially (yet ;) Please enjoy the pictures and feel free to e-mail or look me up on IRC (Undernet) as Saul on #fish or #fishing! 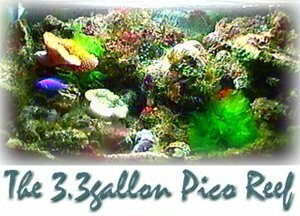 I'm currently starting up a 3.3 gallon pico reef, I'll be updating the pictures as I go; you can have a look at them by clicking below. By the way, I'm looking to trade fragments of my montipora sp. for any other SPS frags. I'd prefer to do it somewhat locally (that's southern Ontario), but let me know if you'd consider shipping etc. The montipora is growing well and I could remove quite a few 1" frags or a few larger ones to trade for the same. See the picture if you're interested.